I have been attempting to eat a little healthier lately (sort of), and in doing so, I came across a little snack that I absolutely love. It is packed full of protein and sure beats out those deep fried snacks that are loaded with sugars. 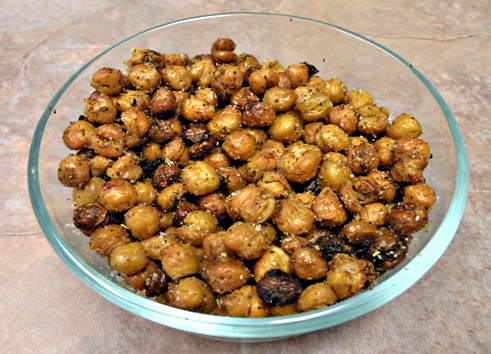 These roasted chickpeas are a yummy and healthy snack! I decided to add some Italian spices to the chickpeas I prepared today, but there are many different ways you can serve these up. You can keep it as simple as adding a little sea salt, or chili powder and cumin, or you could make a sweet snack and use cinnamon or pumpkin pie spice. The possibilities are really endless. Not only are they good as a snack, but they are likewise a great salad topper. So ENJOY and take care! Preheat oven to 400F. Whisk oil and spices together. Add chickpeas to the mixture and toss to coat completely. Spread on a baking sheet. Roast, stirring occasionally, until browned and slightly crispy, 40-45 minutes. They are very delicious! Thank you! These are a tasty snack. Glad you enjoyed them! I’ve wanted to try these for awhile! I like the spices you choose. Looks so good. Btw, I added you to Bloglovin. Ii’ve been missing your recipes! Haven’t been getting the notifications.